Having watched the Australia/England match I am left wondering if the England bowlers are talking to the batsmen this evening. The coaches say you should always look for the positives in any performance. And they were there. The England opening pair Brunt and Shrubsole bowled superbly! It's a while since I have seen an opening spell by both players to rival that in this match. Australia have fine batting line up as England will know well and will probably be reminded during this coming summer, and at 27 for 4 in the 10th over, England were on a roll. I have watched this sport now for almost 20 years and even if conditions are in your favour you need to take advantage of them and the pair did. I once disagreed with a senior figure in the ECB about the best fast bowling performance I had seen in internationals. I was asked only minutes after the match by a friend calling me, where Anya's rated in my opinion. I would certainly put this in the top three which are (in chronological order since I would find it hard to sort a one, two, three in any other way) Catherine Fitzpatrick in the semi-final of the World Cup in South Africa in 2005 against England, Katherine Brunt in a one-day international at Wormsley the last time the Australians visited these shores, and now Anya today. Commentators were saying the start was too early which is possibly true and something for the organisers to think about, although with TV schedules sorted (and that's probably what fixed the times in the first place) don't expect any changes! England's fielding looked to me to be slightly off the pace. An odd thing to say you might think when you see the other side dismissed for less than 150 but every run was to count later. The umpiring was rather worse than abysmal! Both teams suffered although I felt England got the worst of it, especially when the 3rd umpire didn't appear to know his job either. The lbw dismissal of Edwards was particularly ridiculous as the ball would only have struck the second stump outside the leg stump; not even the first. It would have been a glancing blow even then. I doubt many club umpires would have got that wrong and I keep asking my TV where Lorraine Elgar has got to as we need someone of her class at this tournament. One of my correspondent has noted " I think we ought to have had drs at such important matches." I enjoyed one or two moments especially. I liked Holly Ferling's grin when bounced by Katherine Brunt. If you need to show a bowler she doesn't intimidate you there are few better ways of doing it. Sarah Taylor's catch to dismiss Kate Blackwell also got little attention from the commentators and left me wondering how many of them could have taken an inside edge quite so cleanly. It's the outside edge you always expect and it's because Sarah does it with so little fuss she is rather taken for granted. I also liked the fact Lanning walked and didn't wait for the decision. I know everyone round the ground heard the edge but many players look as if their boots are anchored to the pitch at such moments. Don't make yourself look stupid - follow Lanning's example. Only Greenway and Marsh seemed to realise there was all the time in the world. Yes, I know run-rate might have counted later in the competition, but losing counts rather more! England's last wicket stand showed some spirit and came within an ace of winning the match. The Aussies will take the win - well so would England have done if they'd sneaked over the line - but in many ways this match deserved to be a tie. It was a different kind of advert for the women's game; not the plethora of runs we have seen at times, but it did highlight the superb skills of the quicks on both sides. Australia would seem to have a place booked in the final. But who will join them? The White Ferns have had a pretty good ride to date and must be somewhere high in the bookmakers minds. Can England get it back? I haven't tried any "if this and that" type calculations but it would seem to me that their chance of a final's place is now in hands other than their own. And I've received the following concerning the rather strange idea of several games in the competition being irrelevant. I refer, of course, to the fact that you do not carry forward any points won against the sides that are eliminated after the group stage. Also the fact that net-run rate counts for more than what happened when the two sides met, can lead to some odd repercussions. As the England / West Indies situation has demonstrated, it has to be a flawed system if England, having finished above the West Indies – and therefore played overall better than them – finds themselves below the West Indies in the Super 6. It makes a mockery of the concept of the initial groups. There are other flaws and some of these will happen eventually. Picture the situation where team A and B are playing their final game of the group stage and A is playing B. A bowls B out for a low score, say, 100. A then bats well to about 90 with 20 overs left but then has to play out about 15 maidens because its in their interest to beat B but without damaging B’s net run rate too much because its in A’s interest to let B through to the Super 6 because they are about to beat B and having previously lost to C they want B to progress at the expense of C. This nearly happened in this World Cup. If the Sri Lanka / India match had occurred before England / West Indies we could have found ourselves in a situation where England, having bowled West Indies out for very little, could have had to deliberately play out maidens towards the end of their innings (say in the 90s) to allow the West Indies through on net run rate over Sri Lanka because Sri Lanka beat us and we didn’t want that result to carry forward. So Sri Lanka’s reward for beating us would have been to sit and watch as we engineered their demise in favour of the West Indies. This scenario will happen sooner or later. Any system that can allow a team or encourage a team not to perform to their best is odd to say the least! The one action they could take to try to mitigate the unfairness of the system is to allow the 1st to play 4th and 2nd and 3rd as semi-finals after the Super 6. One gets an interesting situation if WI were to beat NZ (unlikely I know). With Australia by then at least being on 8 pts they could deliberately lose to WI in order to ensure that they play WI in the final rather than either NZ or England !! Given a choice between WI, NZ or England I know which they would go for. I thought Australia would win it before hand and I still think they will. They’ve found some fantastic young players (most markedly the wonderful Meg Lanning) and look a lot better than any other team. Final thought. The umpires might have made 2 serious mistakes but that still leaves England batsmen making a heck of a lot more. This scenario that's been sent to me illustrates beautifully the nonsense of the net run rate being used to decide anything when there is a much simpler way of deciding on the order in the points table when two countries finish up on the same point score. All you need is the very simple - "who won when those two sides met during the competition" - which, of course they must have done. There is one thing that bothers me particularly and that is the rules regarding qualification for the Super 6s. In the final game of Group A Sri Lanka beat India very convincingly and deservedly qualified for the Super 6s. But they only proceeded with 2 points. If the match had been much closer and India had scored 251 Sri Lanka would have had 4 points. How can this be fair? They have been penalised for their great performance. If Sri Lanka were more worldly wise when they knew the match was won they could have conceded a few extras by bowling a few wides to ensure India scored 251. Had this have happened India would have qualified with 2 points at the expense of West Indies and Sri Lanka would have had 4. It seems the rules are very bad and are encouraging negative play and the possibility of matches being manipulated. West Indies would rightly have been very upset had this happened but Sri Lanka surely would have been right to have tried to gain the most points they could. While 251 might have been a tad close the the score India needed to win the match for the Sri Lankans to take this chance I can see exactly the point Martin is making. They have paid a penalty for winning well instead of just managing to scrape a win. I have also witnessed today, following England's win over South Africa, the unedifying prospect of sides struggling with spreadsheets to work out how fast they have to bat next time (or possibly how slowly in order to pick the opponents they would rather chose in the final). Is this what cricket should be about? Duckworth/Lewis has made a great contribution to deciding winners in shortened games but my feeling is the maths should be left there. It is even crossing my mind that we could finish with a situation where Australia make it to the final unbeaten and lose to a side that has lost twice. If you can find logic here then I am blessed if I can. I am getting deja vu of the county championship in England last year where drafting of strange rules combined with strange weather gave a - well you can guess the adjective - final. I suggested to others involved in the game that the Championship should be decided by who finished top of the league. Why play a final? If it's a league it's a league. If it's a knock-out you have a final. You can't do that with the World Cup I guess or the TV people would not be happy but it has a greater logic than any other scenario I can think of. That, of course would hand it to Australia right now (barring some really weird goings on), but then they've played that well maybe they deserve it (and that's never an easy thing for an Englishman to say). Good to see a woman umpire at last. One run would hardly have made any difference but leg side balls should be wide in this class of cricket. I must take umbrage with Mel Jones. What's wrong with Holly Ferling smiling at the batsman after beating her convincingly? Both individuals know full well what that smile meant and I'd suggest it can be more effective than a glower. The latter is possibly going to stiffen your resolve but the former is rather disarming. Mel perhaps never batted in front of a certain Yorkshire wicket keeper who was known to distract batsmen using humour. It was rather effective I gather. A batsman trying to stop laughing is perhaps not concentrating as she might. Ferling was most refreshing to watch; the smile rarely left her face and her attacking mode for someone so new to international cricket shows the Aussies could have a strike bowling find here. I felt Rasangika played very sensibly. With a tightly packed field singles were always going to be difficult, so chose your delivery and give it everything. It was all defence or all attack and that she did very competently! I agree with Mel totally however on the need for SL to play more top sides. Perhaps also sides like the England Academy and the Australian Shooting Stars could tour there more often. I feel Kaushalya should bat one spot higher up. I know she came in early (in terms of overs) in this match but there is always the potential for her to be left with the tail struggling. There should be one regular batsman to follow her to ensure you get the best from what can be a mighty hitter, or she could run out of partners. Blackwell's catch was extremely difficult. Get it wrong and a visit to the dentist might well be required. It showed great courage as well as skill. I noticed that at times Fields had sufficient faith in Schutt that 7-2 fields were set. It was hard to tell from the TV coverage if that was true of any of the other bowlers. Osborne's bowling was quite remarkable and her pitch map showed a grouping any man or women in the world would have been proud of. She earned her career best today. Sri Lanka have only managed to score 82 against Australia in 2000 and 57 in 2005. That's the only two previous occasions these sides have met. As easy a victory as this was for Australia 131 is a great improvement! Sri Lanka should also take away from this tournament their two giant killing escapades. Today they batted in the most difficult conditions of the day or their score might have been greater. Meg Lanning was the best looking player of the tournament so far. I know Haynes got the higher score but Lanning's obvious power to simply take over the game was obvious even in an innings in the thirties. Cameron got away with an lbw that might well have been overturned by drs. As one of my emailers suggested this tournament needs that, especially if they are to continue with umpires of this quality. Today they were pretty good on the whole, but we have seen some nightmares in several games. Shrubsole appears to go from strength to strength. 5-17 is a fine performance against any of the sides in Mumbai. She, above anyone in the England team, has given them a chance at the final, slim as that chance now is. She can certainly fly home content she has done more than her share, final or no final. Taylor's three ducks in a row is cause for concern, especially when the last two innings have lasted only three balls. Form is temporary, class permanent so they say - England must hope the form returns soon. If England have been muttering prayers to the gods recently, they were answered today as West Indies defeated New Zealand with relative ease and a margin of 48 runs. This it must be said would be considered against the 'form book' and leaves all kinds of scenarios possible for the final. It feels as if the fate of the teams is more in the hands of the mathematicians than the players, although this is, of course, not the case, but it has been necessary to drag out the spreadsheets to see exactly who's where and what they need to do from here. There is also the potential for some very slow batting by one side but I'll elaborate more at the end of this World Cup with some suggestions on how some of the dafter situations that have arisen might be prevented next time. If you'd like to make any suggestions for that list then do email me. Did I hear some of the commentators call the NZ team the Silver Ferns? A 'Net search reveals this is the NZ netball team. I also noticed the women's kit worn by the White Ferns is not identical with the NZ men's. While the design seemed preferably, I did notice the ANZ bank logo was missing. Don't they sponsor the women's team? Not necessarily a wise commercial decision I would have thought. 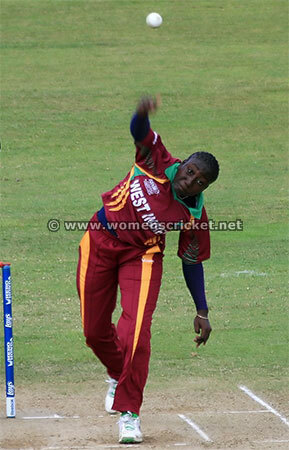 Stafanie Taylor was very impressive on both back foot and front. She picked her attacking shots with great care and showed she had a great technique for building a long innings. I look forward to seeing her play one and I don't think that's likely to be long coming. Kycia Knight seems to be predominantly a back foot player. West Indies generally looked for the singles perhaps more efficiently than any side in this tournament so far, and they were up against a team with the reputation of being one of the best, if not the best, fielding side in Mumbai. Ruck's boundary fielding was outstanding. The pitch did not give the swing previously evident in earlier matches, although some gentle swing was still present. This did not give the kiwis as big an advantage in winning the toss as they had hoped and is something captains in the future matches may have to think about rather carefully when choosing whether to bowl or bat. I noticed many of the West Indies women walked when dismissed without waiting for the umpire's decision. I have always approved of this habit but sadly I know many coaches encourage or even bully players into standing and waiting. I suppose I have no quarrel with this as long as players make no sign whatever of dissent when they get a shocker of a decision. You chose to go with the umpire so you have to put up with the result. A 'walker' is perhaps entitled to look surprised but I would say a 'non-walker' is not. On a related note, this match was once again marred by poor umpiring. Where are the international umpires we've had in the past? I was amused by the "Come on, ladies" heard regularly from the West Indies fielders .. Not what you'd hear from England or Australia I suspect. 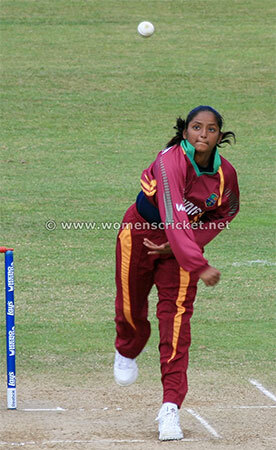 The commentators remarked that Anisa Mohammed had never bowled a no ball in her career since she bowls from the back crease rather than the popping crease. Although I did not notice it in this match I have seen her touch the return crease, unnoticed by the umpire. Dottin's bowling was at times within a one or two mph of Katherine Brunt. I had no idea she was this quick. Following an absolutely superb piece of fielding resulting in a run out, I noticed NZ singles were no longer taken if the ball was within many yards of Dottin! It was good to see Haidee Tiffen and Katrina Keenan in the management of the NZ team. Their wealth of experience must count hugely in their team's favour. One other anomaly has just crossed my eyes in the regulations in this World Cup. For some reason it slipped my notice that while points against the teams relegated before the Super 6s are dropped for the later stages (and I've already remarked on the fact that's odd in itself) the Run Rates are carried forward! Now I am no fan of NRR as you will know, but this seems to make the inconsistencies in these regulations even crazier!! Also one other reputable site has written on the poor standard of umpiring. How's this for a headline? "White Ferns go down in poorly umpired match"
And yet more nonsense on the NRR (although perfect sense from my correspondent), written before the final round games were played. If you want the latest dose of NRR insanity - here it is. Consider (a) Aus score 250 from 50 overs and the West Indies score 249 from 50 overs and (b) Eng score 250 from 50 overs and NZ score 249 from 50 overs. You might think that the WI (current NRR of 1.136) would still be ahead of England (current NRR of 1.079) but no. WI would drop to 0.8869 and England would drop to only 0.9285. Here’s another one. If Aus were to beat the WI well enough and England and NZ were to tie then who of Eng or NZ goes through depends on the score. Any score of 52 or less and NZ would go through on better NRR – even though Eng started with a better NRR and the scores are tied !! You couldn’t make it up. Well now we know that West Indies have decided not just their own fate but those of England and New Zealand also. If you were a real cynic you might ask whether Australia 'chose' their opponents for the final. I think there's probably about a 1% chance that is so. Let's take the position though that those kind of tactics were considered. You then have to decide if you wish to face more consistent teams in NZ or England (and the choice of which would be out of your hands) or a volatile team who you might well blow away or who might just as readily blow you away. Not an easy choice to make! I was somewhat distressed to see a quote from Catherine Fitzpatrick, arguably the finest fast bowler the sport has seen, which included the phrase "the focus in women's cricket shifting to Twenty20." All I can say is "Please - No!!" Surely, if anything special has come out of this tournament, it is that 50-over cricket is where the future should lie. We have had some hugely exciting games, minnows beating the big guys, and fine cricket in all the televised matches. Obviously I can't speak for the others but surely it would be true there too. T20 may have its place, but you will have noticed that already in men's international cricket, the number of T20 matches played in any tour is on the decline. Some said the format would be a 10 minute wonder, and while it has been more than that, the enthusiasm of the initial launch is now looking to have been over blown. The next time West Indies, and the first time Sri Lanka, tour England to offer them only, or even mainly, T20 matches would be an insult in view of the status of those two sides at this World Cup. There might even be those suggesting England were scared of meeting them in the 50 over format. Still, I am sure that won't happen and those sides would be offered games befitting their new-found status. During this tournament I have been preparing a note on how I would have changed the rules to try and eliminate the idiosyncrasies the current set have thrown up, only some of which appear earlier in this ramble. Yes - I could have listed even more and one last summary is shown below! I will make this list live after the final match and would very much welcome your thoughts. My main aim is to remove (or at worst reduce) the importance of NRR for which no one I have been in communication with so far has managed to even propose a rationale let alone an explanation, and to increase the importance of actual match results. These ideas, proposed and circulated to a few correspondents long before the end of this tournament would have given rise to a different final. Whether it would have been a more 'just' result you can debate. The final dagger in the heart of the ‘Super 6 NRR’ fiasco has to be the following. England and the West Indies played exactly the same teams in this competition. I would only add that you play to the rules you have but I can see his point. As you will see later - if you're not nodding off already at this stage - is how a simpler system, NRR being largely ignored, would have been fairer to all sides. ... yet despite the better performance England did not make the final and West Indies did. In other words the system did not deliver the better team into the final. A completely discredited system. What is more England soundly beat the West Indies. It is utterly beyond my understanding how cricket can be run by people that actually think this is a fair system. To me the success story of this tournament is how the minnows have performed. Indeed are we fair calling any of them that any more? My congratulations go to Sri Lanka and the West Indies for showing what they can do and a possible (I hope probable) glimpse into the future. And a final no one would have expected when starting this tournament, or indeed after the West Indies performance in the group stages. Before the first game was played it might have been difficult to get any odds about the Australians reaching the final but who would be there opponents? With India the host country there would have been quite a few thinking they had an excellent chance and serious money could have been made if you could have found anyone to take a bet on India going out before the 'Super 6s'. Then Sri Lanka started beating teams who must have taken the field thinking this was a handy warm-up game. Add to all that England losing to Australia when it was in the palm of their hands, and you've had probably the most unpredictable Word Cup ever, and the girls have been at this longer than the men. Good to see Perry and Hunter high 'fiveing' (or more like low 'fiveing') the young kids after the opening ceremony. Some of those kids will never forget that. It's a way of giving back to the sport that has taken you to the top. Australia winning the toss has almost decided this game before it starts (and I'm typing with only a few overs gone in the game so far). The organisers will have to rethink this day/night business - comments later on this. Surprised to see no Holly Ferling in the team. I know exactly who I would have dropped to make a place for her but perhaps not polite to say. Why not play her and Perry? I don't feel this would have unbalanced the side but presumably the Australian management did. I'd have to agree (yet again in this competition) with Mark Butcher on this one. I like the maroon and blue cream on the WIndies players faces - very patriotic. Taylor bowling full and straight and it is so obvious that's what's required that I can't understand why the other bowlers haven't clocked it. Typing as the match goes on - Quintyne is by far the pick of the bowlers and the trick has been length. Rachel Hynes was very undemonstrative on reaching her 50 - it seemed she realised a bigger score was on the cards. Kyshona Knight takes a fine over the shoulder catch. On the run there's no such thing as an easy one. Poor umpiring again as a field change is allowed for a free hit, the batsman not changing - a short run was also missed a little later. One commentator said about the 'catch' that was turned down apparently taken by an Australian slip fielder that "you have to go with the player". This is nonsense! Players don't always know if they have taken it on the half volley, and today, when players don't walk but stand in spite of the fact they know they should be out, I am sure fielders sometimes claim what they know is not a catch. I am utterly convinced that Lanning thought she had it, and she probably did, but umpires can no longer go by such protestations because of the actions of a few. It is one of the sadder aspects of the modern game. With Lanning and 95% of current players I would be happy to accept their word being a spectator, but the umpire has to be independently sure and when he can't be 'not out' is the right decision. Perry was quite amazing considering the ankle was always bothering her, and the way Dottin played out a maiden showed both Perry's prowess and Dottin's level head. Aguillera's six off Osborne was brilliant and I wondered if Dottin's was the biggest of the tournament as it bounced up the concrete steps in the stand. When Dottin went everyone except the commentators must have known the match was over. The tail added a few runs more as a matter of personal pride (and quite right too) but WI were never going to win from that point. There have been many highlights in these last few weeks and maybe I'll pick the players who have impressed me most. I must think about it. But meantime a quote ... "It was not an exciting game of women's cricket, it was exciting cricket"
Jarrod Kimber. From "A Disgrace no More"